According to the internet, “Kwang” is the Thai word for venison. There, now you’ve learned something today. You’re welcome. Scroll me down to the recipe! 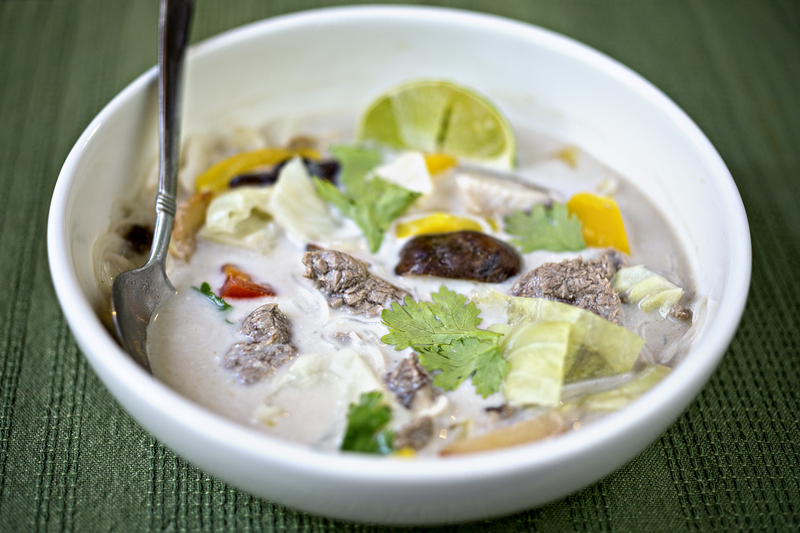 Tom Kha Gai is the ever popular coconut milk soup with chicken you get at any Thai restaurant in the west. I’m pretty sure, at least according to my most favorite South East Asian recipe blog, that Tom Kha is, was, and always has been all about the chicken. But this is not a chicken blog, this is a wild game blog. Why the hell not? I used tenderized chunks of round steak as well as some smoked jalapeno (sans cheese). I don’t know why, but my unapologetic American self thinks using small amounts of different kinds of meat seems like a very Asian thing to do. (I’m thinking of that curry noodle dish called Singapore Noodles, with bits of pork, seafood, and about the whole kitchen sink tossed in. Now that I think about it, we need to show you guys how to make that in the near future.) Since this is a quick cooking soup, you really want your meat pieces to be as tender as possible, so hammer away! First, put your stew meat into a bowl of cold water to leach some of the blood out while you prep your other ingredients. 15 minutes is okay, 30 is better. Put your water or broth in a stew pot and add the galangal, lemon grass and kaffir lime leaves. Bring to a gentle boil and simmer for about 10 minutes. Rinse and season your stew meat with a little salt and pepper. Bring the broth back up to a boil, add the stew meat, then bring back down to a simmer. At a simmer, add the mushrooms, veggies, and sausage. Simmer until everything is cooked and just tender, about 20 minutes. Add the coconut milk, chiles, and fish sauce and take off the heat. Serve over vermicelli rice noodles (if desired) and garnish with lime wedges and cilantro. Non game substitution: Chicken, of course! Feel free to throw whole chunks in there, or use boneless skinless breasts and hammer thin before cutting into chunks. Vegetarian substitution: Mushrooms and tofu are both wonderful additions, whether or not you are a vegetarian!